Black Tie Grinders, the leading premium herb grinder brand, announced that it will begin accepting Bitcoin payment for Black Tie Grinders and associated merchandise. The move allows buyers to choose from a greater variety of payment methods outside of the typical fiat currency models. “We value the privacy and technological advancements offered by Bitcoin and other cryptocurrencies, and wanted to give our buyers greater choice when it came to payment” said Nick Daniels of Daniels Industries, LLC, which operates the Black Tie Grinder brand. The new payment options offered by Black Tie Grinders is not limited to Bitcoin, but also several other popular digital currencies including Litecoin, Dash, Decred, Digibyte, Dogecoin, Ether, Potcoin, STEEM, Monero, and Waves. Black Tie Grinders was started with a vision to create an herb grinder that had the quality of high-end brands, but at a price point that was affordable to the masses. From these humble beginnings the brand has now grown and sells their Black Tie Grinder in the US and many European countries. This innovative spirit makes Black Tie Grinders a great match for digital currencies. Purchasing Black Tie Grinders using Bitcoin and other digital currencies is simple. To purchase Black Tie Grinder merchandise using digital currency, customers will select “Coinpayments.net” in the checkout page. Click “Place Order” and you will be taken to a screen where you can decide which digital currency you want to use as payment. 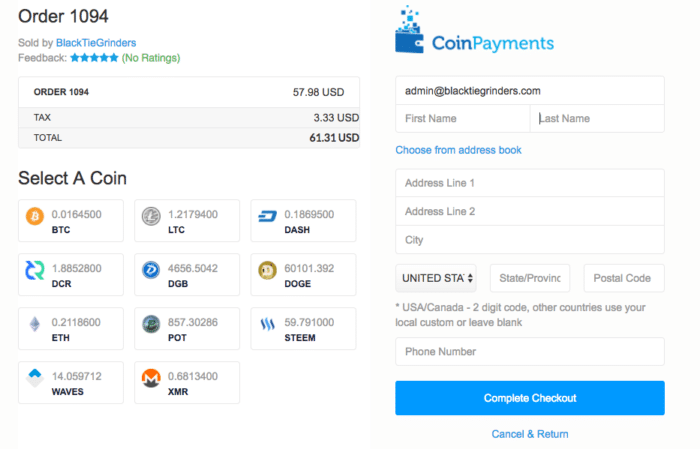 After selecting the preferred currency buyers will push the “Complete Checkout” button and will be taken to a page where they will be given the wallet address to the send payment. Once the payment arrives in the receiving wallet the order will be processed promptly. Black Tie Grinder is a world renowned herb grinder brand. Their products have been featured in Men’s Journal, Dude I Want That!, HERB, and .Mic.